It is easy to forget, when you are surrounded by some of the most desirable cacti offered for sale in Europe, that this is a Thelothon, so I’m pleased to report that we found Thelocactus hexaedrophorus and T. conothelos today. Most Thelocactus taxa are quite found over a wide area, so the trick is to select plants from populations where other cacti may steal the limelight, to add interest to the exercise. But the day began less promising with the failure of ATM machines to give us our money and a sudden bout of Montezuma’s revenge, fortunately in the car park of the Matehuala Walmark where the disabled toilet made a very welcome changing room. I had selected two targets for today’s ‘organised search’ with plenty of scope for more spots to look if time permitted. The first was a spot for Turbinicarpus macrochele, which we had failed to find here in 2011, but with two fresh pair of eyes, seemed worth another try, but to no avail. I had hoped that may be one or two plants might be in flower to allow us to get our eye in. I’m sure that the plants were there, but without flowers, won the game of hide & seek. 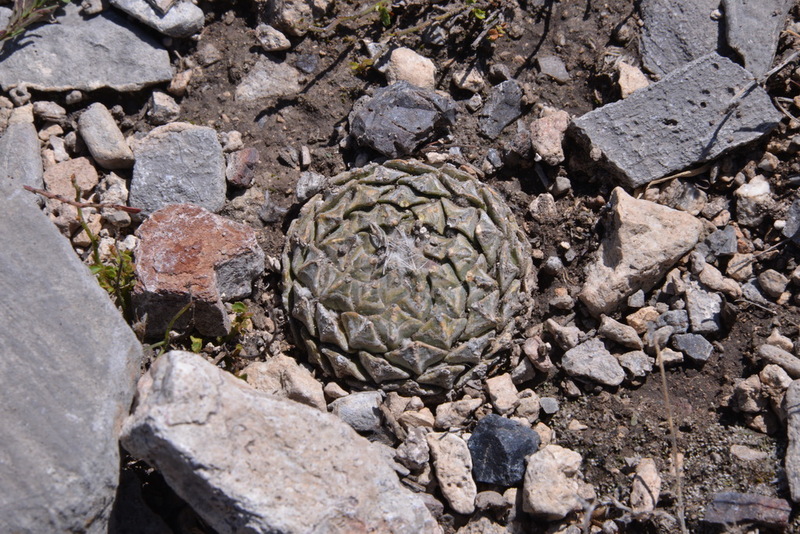 The second stop was along the track to El Refugo and this is where we found the Pelecyphora. I’ll have to check when I get home but I believe that this was a different location to where we found them in 2011 but on that occasion had failed to find any of that taxon. They were much more abundant this time, including a large number of small seedlings that could easily be mistaken for Turbinicarpus seedlings, but Cliff and Ian easily recognised them as Pelecyphora seedlings. Other cacti found here (S3060) were: Agave sp., Ariocarpus retusus, Dasylirio sp, Echinocactus horizonthalonius, Echinocactus platyacanthus, Echinocereus pentalophus, Lophophora williamsii, Mammillaria sp., Neolloydia conoidia, Pelecyphora strobiliformis, Portulaca sp, Stenocactus sp., Thelocactus conothelos and T. hexaedrophorus. You can see why we can spend a few hours walking around these fields and hillsides! The third stop was for pictures taken around the scenic town of Dr Arroyo, where Cliff broke the golden rule among cactus explorers: don’t go with an unknown local to get money from the bank. In this case the local was the cousin of the owner of the hotel and the ATM was across the square of the Plaza Hotel, a responsible calculated risk, with the police station across the road from the hotel. Tomorrow we head to Galeana.